Versatile, low-cost stud type mounts for vibration, shock and noise control, and motion accommodation. Barry Stud Mounts are designed to support loads up to 260 lbs. per mount in compression and up to 70 lbs. in shear. Their simple design and sturdy construction permit their use in a wide variety of industrial applications. Available in 3 styles: (1) Double stud, (2) Bumpers, (3) Stud/Insert. 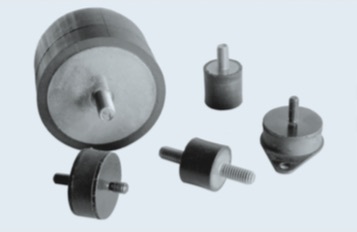 Natural Rubber elastomer has an operating temperature range of -30°C to 70°C. Other materials are available on special order to meet specific operating characteristics.